West of Varna, only 18 km. 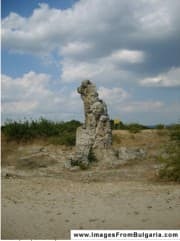 it, on both sides of the road to Sofia, opens before us an interesting view, the phenomenon Dikilitash known as the Fossil Forest. This is the first area declared a protected area in 1937 compositions by huge columns overgrown with moss like it belongs on our planet, the origin and many legends - they are brought from the Giants for construction of Pliska, unnecessary simply left ground, the columns are petrified trunks of trees. Scientists are unique natural creations since the Eocene as a result of underwater volcanic activity, increased release of methane gas cascading molten lava during cooling to stone, thus forming a strange columns. The area is surrounded by mystique and mystery. Among Fossil Forest stands a stone throne resembling a ruler, or elder. The columns are about three hundred in number arranged in groups and reach a height of 5-6 meters in diameter to two feet and a half, constructed of limestone sand among which may be distinguished pieces of shells and snails, some are hollow inside and other dense, weather them and undertake and formed shapes. Between Pobiti poles run the beautiful rare species of lizards, insects, meeting a wide variety of birds.